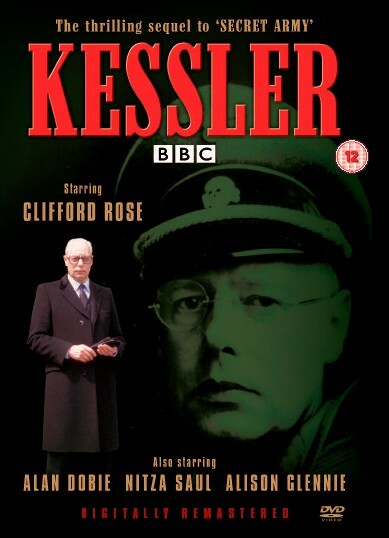 KESSLER was first transmitted between 13 November and 18 December 1981 and saw Clifford Rose reprise the role of Ludwig Kessler. The series also starred Alan Dobie (War and Peace, Cribb) as Richard Bauer, Nitza Saul (Doctor Who - Warriors of the Deep, Star Cops) as Mical Rak, Alison Glennie (Blake's 7 - Power) as Ingrid Dorf, Nicholas Young (The Tomorrow People) as Franz, Guy Rolfe (Secret Army) as Yqueras, Oscar Quitak (A Very British Coup) as Josef and Ralph Michael (Empire of the Sun) as Ruckert. Also making guest appearances in the first episode are Secret Army regulars Bernard Hepton, Angela Richards and Juliet Hammond-Hill. The series was written by principal Secret Army scriptwriter (and script editor) John Brason and Secret Army producer and creator Gerard Glaister. Secret Army stalwarts Michael E. Briant and Tristan de Vere Cole shared directing duties. Kessler is due for release on DVD and Video by DD Home Entertainment on 10 October 2005.